The unique and beautiful quality of the Waterslager Canary's song is reflected in its name, the word 'waterslag' literally means 'water beat'! The popularity of the Waterslager Canary has been ongoing throughout its history and continues to grow as it has many desirable traits. Though it is not particularly social and does not like to be handled, this melodious little bird it can make a wonderful companion to be enjoyed for its song. The Waterslager Canary has a beautiful full song, likened to the sound of bubbling water with a distinctive nightingale accent. Their repertoire also includes bell and flute sounds unlike any other bird. Though not as loud as some canaries, being of a soft to medium strength, they are renowned for having the widest range of all song canaries. The Waters lager Canary is one of several well known "song canaries", those bred solely for song rather than physical appearance or color. Shows for these birds are of a different nature than shows for other canary types. Basically being entered into singing contests these canaries are bred with the goal of achieving winners with the best balance between quality and variety of song. Each breed has a distinctive song and a well-defined song standard. Some of the other well know song canaries include: the Roller Canary, the American Singer Canary, the Russian Singer Canary, and the Spanish Timbrado. Distribution: One of the oldest breeds of canary, the Waterslager Canary is also known as the Belgian Waterslager Song Canary, Waterslager Song Canary, Malinois Canary, and Water Singer. Like the term Waterslager, all these common names are different representations of this bird and its characteristics. The term 'water' describes the distinct sound its song is noted for, while 'Belgian' indicates its country of origin, and 'Malinois' is drawn from a French named town in Belgium where dedicated fanciers developed this breed (in English it is Mechelen, Belgium). Originating in Belgium, one of the earliest accounts of this breed were included in a French travelogue in 1713 where the author describes observing this canary while stopping at the town of Malinois, Belgium. It has been most popular throughout its history in Europe, and is growing in popularity in the United States and Canada. Description: The Waterslager Canary is bred for its song rather than its physical appearance or color, but it is a fair sized bird reaching lengths of about 6 1/2 inches (16.5 cm). It has some distinctive traits to its head such as a larger more cone shaped beak and a sharper bite than other canaries, shiny bright black eyes, and when excited the feathers on the back of the head rise up giving it a bit of a crest. This canary has soft feathers and their colors are yellow and white, though in varying shades from pale to quite strong. Dark ticking is common and is usually accepted for show as long as it does not cover over a quarter of its plumage. The wonderful song of the Waterslager Canary is distinct and melodic. Like the Roller Canary it will mostly sing with its beak closed, but will also open it for pronounced sounds. Its song can be described as having the sounds of 'water' as well as the sounds of a nightingale. The water sounds are a mimicking of water flowing, water dripping into a pool, or a babbling brook. The Waterslager must make these "water notes" or he will not be accepted as a true Waterslager. They also have the lowest and highest range of notes for all song canaries. Canaries of both sexes can begin to sing a weak song as early as four weeks, but females usually don't sing after about six months and won't have the full long song of a male. They do like to bath, so should be offered a bird bath.Cage cleaning and toe nail trimming is about all the maintenance canaries need. See Canary Care for more information. Social Behaviors: Canaries in general are good-natured social creatures that do well when kept in cages or in aviaries. However, the Waterslager Canary is not prone to being as sociable. They do not like to be handled and they do not particularly like the company of other canaries in the same room. All canaries are timid birds and should not be housed with parakeets, lovebirds, or other hookbills that tend to be more aggressive birds by nature. Male canaries should be kept in a cage by themselves to ensure quality singing. Males can be territorial and pairing up with two male canaries in a cage can cause fights. Older males do not even do well in flight cages or aviaries and are best housed separately. For singing contests the Waterslager Canary requires training. They are trained to sing well defined song segments, called 'tours. They can be trained either from listening to another perfect adult singer or from a recording. As they are also quite adept at mimicry, If they develop any faults in the song they must immediately be removed from any other birds being trained. The Waterslager Canary is a more difficult bird to breed, though the males are often better parents than females. In general these birds have a hard time settling down especially if there are other birds around. They will not always sit the eggs, are not always good feeders, and can be prone to severely plucking their young. 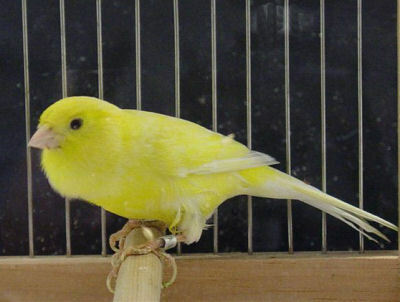 Availability: Waterslager Canaries are most often available through breeders, but may also occasionally be found through bird shows, bird clubs, and on the internet. Can you told me how much is the water slager Canary price? Hello. You will forget forever about Waterslager after you hear a nice Russian canary singer, you can go to youtube and listen to a good Russian singer of pavlovo breeder Apollonin. All the best. I was a member of The Bronx Roller Canary club in the 1970. For health reasons, my sons', I had to give my birds away to the president of the club. I have been trying to purchase a trio or two of rollers, since the president of the club passed away I have not been able to get in touch with the members if they still have a club. You may send me a message or contact me at 19392490506. Thank you very much.